A group of Douglas College theatre students is putting on a production that delves into the relationships of men and women living in urban North America. 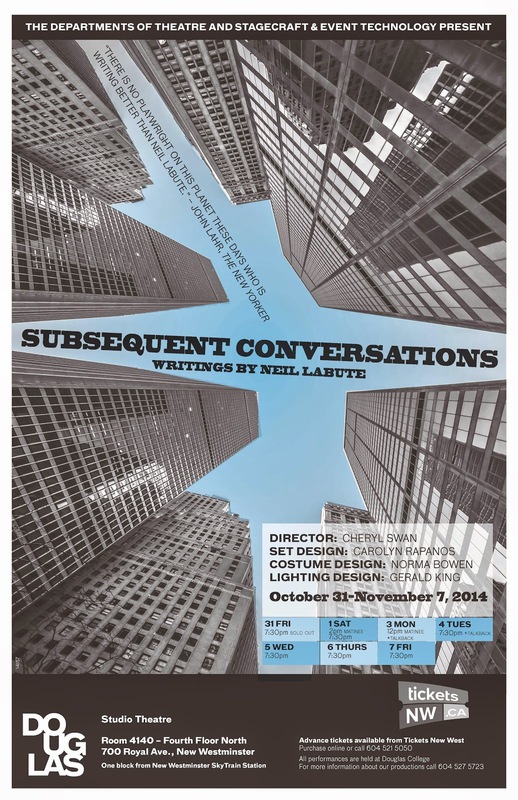 Subsequent Conversations, a series of one-act plays, is being presented by the Douglas College departments of Theatre, and Stagecraft and Event Technology October 31-November 7. The production features five works written by Neil LaBute, a multiple-award-winning U.S. playwright, including Bench Seat, Land of the Dead, A Guy Walks Into a Bar, Merge and The Shape of Things. "We are excited to present this unique collection of Neil LaBute’s one-act plays," Director Cheryl Swan says. "I carefully selected works from his repertoire that I hope will challenge our theatre students and engage our audience. With this production you can expect complex characters, a darkly comedic sensibility and definitely some surprises." Subsequent Conversations runs October 31-November 7 at the Studio Theatre, Douglas College, 700 Royal Ave., New Westminster. Tickets ($8-$12) are available through Massey Theatre, 604 521 5050. For more information, visit the Arts Events webpage.